Can a sculpture show emotions? Image credit: Glimz. This image is published under this creative commons license. I was aware of photos that show emotions and paintings that show emotions, but can a sculpture show emotions? An expressive sculpture that shows human emotions is perhaps the most difficult art form. 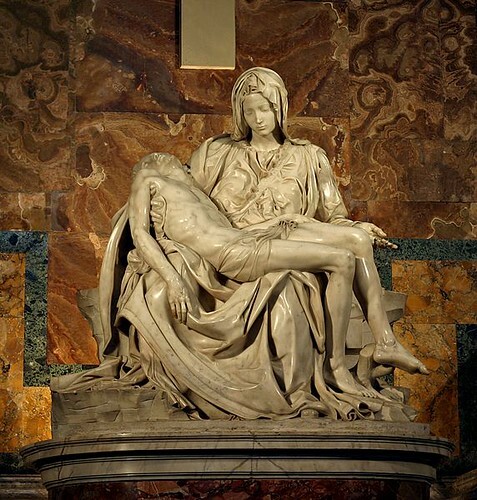 Michelangelo’s Pieta, as shown above, is a stunning sculpture that depicts Mother Mary carrying mortally wounded Jesus in her lap. There are a lot of nuances behind this masterpiece, and you can read about them here. Isn’t this sculpture expressive? I find it amazing! true, it is simply marvelous! Oh. I have not seen that movie. I like architecture in general, but emotions in architecture bowls me out! It’s difficult to be expressive with sculptures, to say the least! yes sculptures also show emotions! This one does. But I think its difficult to make expressive sculptures! As you said, showing expressions on a sculptured figure is something very very difficult, almost genius. Michaelangelo was one! Wonder why there are a very few people who can work masterpieces like that… There are so many painters/artists in comparison! Yes surely, with a genius sculptor as this!! Marvellous! They are gorgeous. They do depict emotions. In Louvre museum and in Vatican, there are some impressive sculptures which are very artistically carved!